I'm working on several projects that are all in various states of completion, so I haven't had much to share lately. 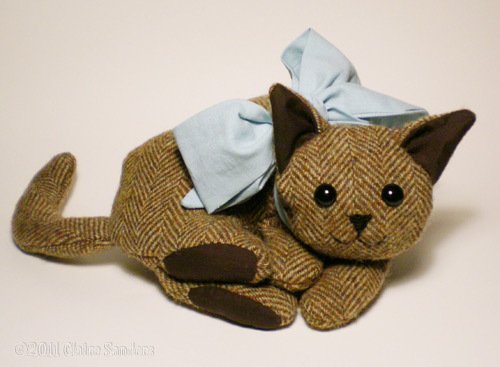 Here's a tweed kitty plush that I made today. It's fun experimenting with different fabrics, like wool tweed, to make stuffed animals. I've got the pattern finished, so all I have to do is work on the instructions then I can make it available to everyone. Oh please I would like have the pattern. It's so cute!!! Thanks so much, I'm working on making the pattern instructions. I'll keep you posted. Pretty please, I need that pattern?